Dear Cartoonist, The terrorist attacks on March 22, 2016 in Brussels are the reason the cartoon exhibition 2016 was canceled. 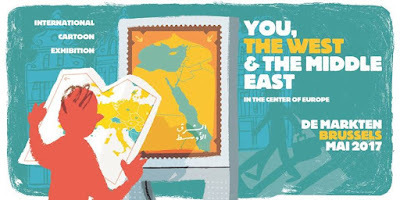 But we have good news: The cartoon exhibition YOU, THE WEST AND THE MIDDLE EAST will take place in MAY 2017 in “DE MARKTEN” Last year we received more than 700 cartoons, from which we selected.. Invitation To Cartoonists Worldwide To Participate, Brussels, Belgium..
First Edition – Second Call. 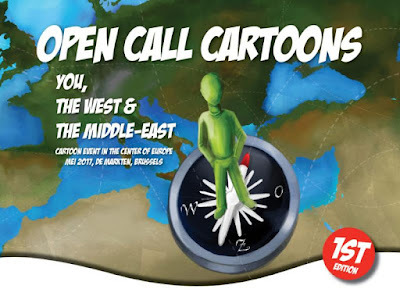 Cartoon event in the center of Europe. May 2017, DE MARKTEN, Brussels. The terrorist attacks on March 22, 2016 in Brussels are the reason the cartoon exhibition 2016 was canceled. But we have good news: The cartoon exhibition YOU, THE WEST AND THE MIDDLE EAST will take place in MAY 2017 in “DE MARKTEN”. Last year we received more than 700 cartoons, from which we selected 130 cartoons. On the occasion of this international exhibition in May 2017, we want to update our selection! If you would like to contribute to this groundbreaking exhibition, please submit a selection (2016-2017) of your cartoons before March 20, 2017. How to participate and send your cartoons? ALL USEFUL AND NECESSARY INFORMATION HERE!